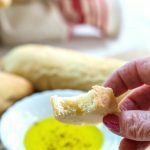 Garlic Batard is an artisanal bread that looks like it came from a bakery but is just as easy to make at home. This bread has a great crunchy crust and a tender center. The garlic is present without taking over. It’s been a while since I participated with one of my bread baking challenge groups. That doesn’t mean that I haven’t been baking bread, but I seem to bake the same ones over and over. One thing that I’ve never quite gotten is a bread with that crunchy crusty exterior. That is until this Garlic Batard. Garlic is the theme this month with our BreadBakers group, hosted by Karen with Karen’s Kitchen Stories. You need to start this bread the day before so it’s helpful to read through all of the instructions before you start. This recipe instructed you bake on a baking sheet. I slid mine onto a heated stone using the parchment paper. I roasted my garlic for this recipe. Roasted garlic is milder and I didn’t want anyone to bite into a chunk of garlic that they would be tasting for the rest of the day. I mashed it up and mixed it throughout the dough, and it was perfect. Every bite has a pleasant garlic taste but it doesn’t take over. 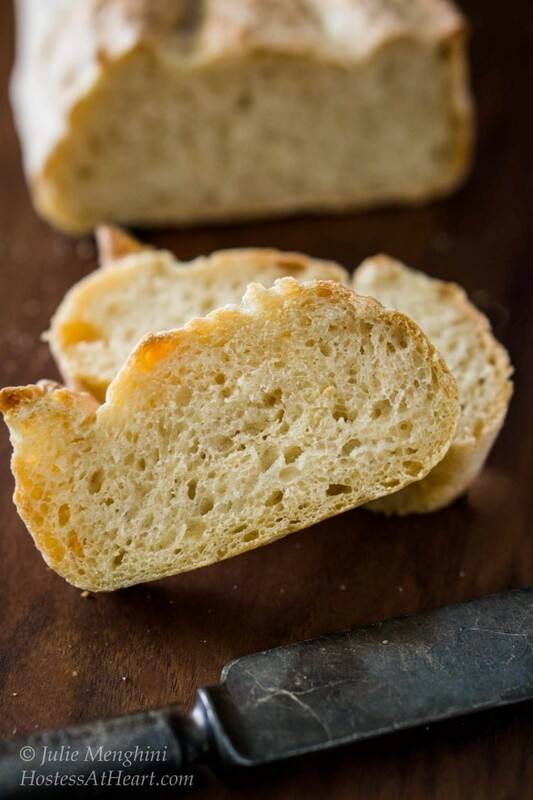 This bread would be absolutely perfect with a pasta dish. These steps may look daunting, but trust me, they are easy to follow. 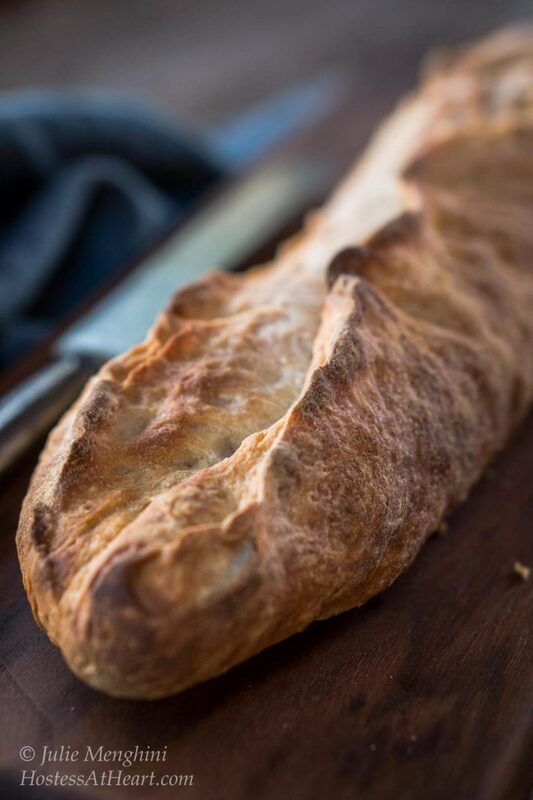 An artisanal bread that looks like you bought it at a bakery but made in your kitchen. This bread has a crunchy crust and a tender center. The garlic flavor is present without taking over. 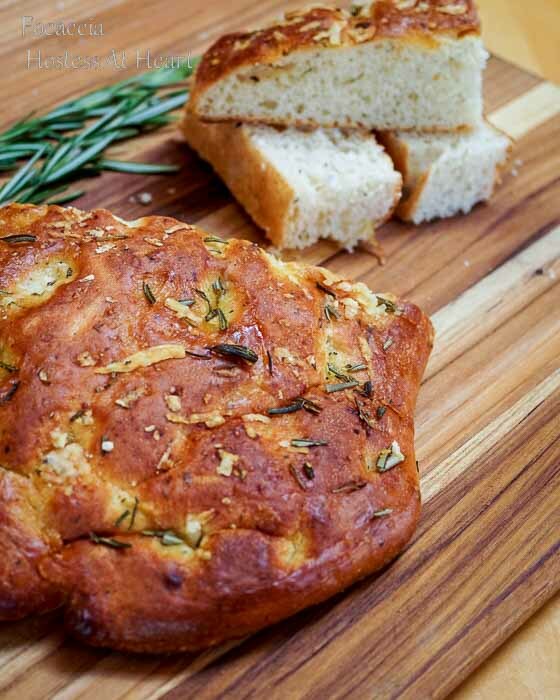 This bread would be perfect with a plate of pasta! Slice the top 1/4 off the bulb of garlic and drizzle with olive oil. Wrap completely in aluminum foil. Put into a 425 degree F oven for 35 minutes. Allow the garlic to cool to touch. Squeeze from the bottom to remove garlic into a dish. 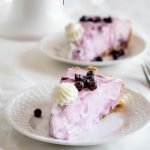 Cover and refrigerate for up to 2 weeks or 3 months in the freezer. In a medium-sized bowl, combine the poolish ingredients. Mix until combined. Cover and let sit at room temperature for 12 to 16 hours or until large bubbles and holes emerge. Add the water to the poolish and mix to combine. Add the flour and garlic. Mix to combine. The dough will feel tough and look craggy. Cover and let rest for 20 minutes. This allows the gluten to start developing and will make kneading easier. Add yeast and salt. Knead the dough until it's fairly smooth, 5 to 7 minutes. It still will not feel elastic but will be smooth. Place the dough into a lightly greased bowl, flipping once to oil both sides. Cover and allow it to rise at room temperature, 1 1/2 hours. To allow the gluten to develop and distribute the yeast's food, turn the dough every 30 minutes during rising time; gently fold all four sides into the middle and turn the dough over each time. On a lightly greased work surface, divide the dough in half. Shape each half into a rough log, cover and let them rest for 15 to 20 minutes. This allows the gluten to relax. Shape the logs into 12-inch batards. See KAF shaping video if you need guidance. Place them on a baking sheet lined with parchment paper. Cover with lightly greased plastic wrap and allow to rise at room temperature about 2 hours. They should rise about three-quarters of the way to doubled. Don't over-rise or they will lose their shape. 4. Set oven rack to middle position. The oven should be pre-heated to 425 degrees F, making sure you give it plenty of time to preheat. This bread needs to go into a hot oven. I also preheated a baking stone instead of baking my bread on the baking sheet and slid it onto the stone using the parchment paper. 5. 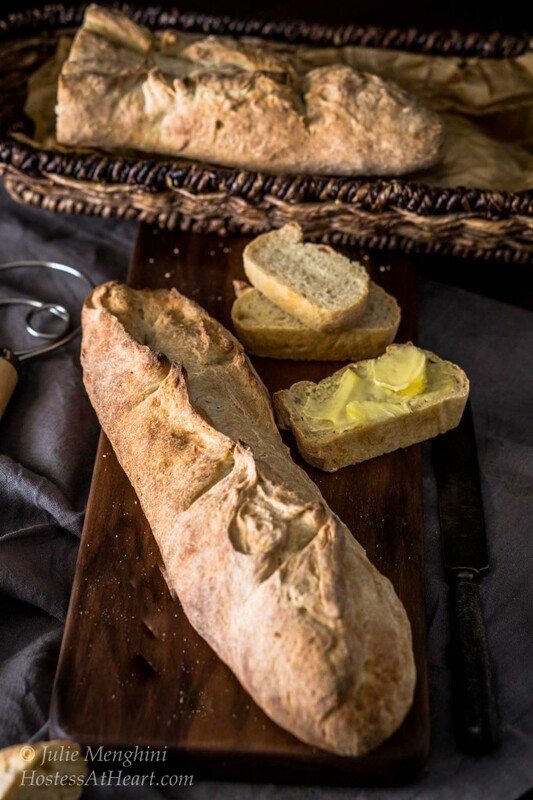 Hold a sharp knife or razor at a 10 to 20-degree angle and make 3 to 4 slashes vertically down the length of the bread, each running about 1/3 the length of the bread. Spray the loaves with warm water. 6. Bake for 30 to 35 minutes until the bread registers 190° F. Turn the oven off and crack the door open about 4 to 6 inches, and allow the bread to cool in the oven. This will help the crunchy crust to develop. 7. Bread should be eaten the same day it is baked. These loaves will go stale. Day old bread can be reheated for 5 to 10 minutes in a preheated 350° F oven. 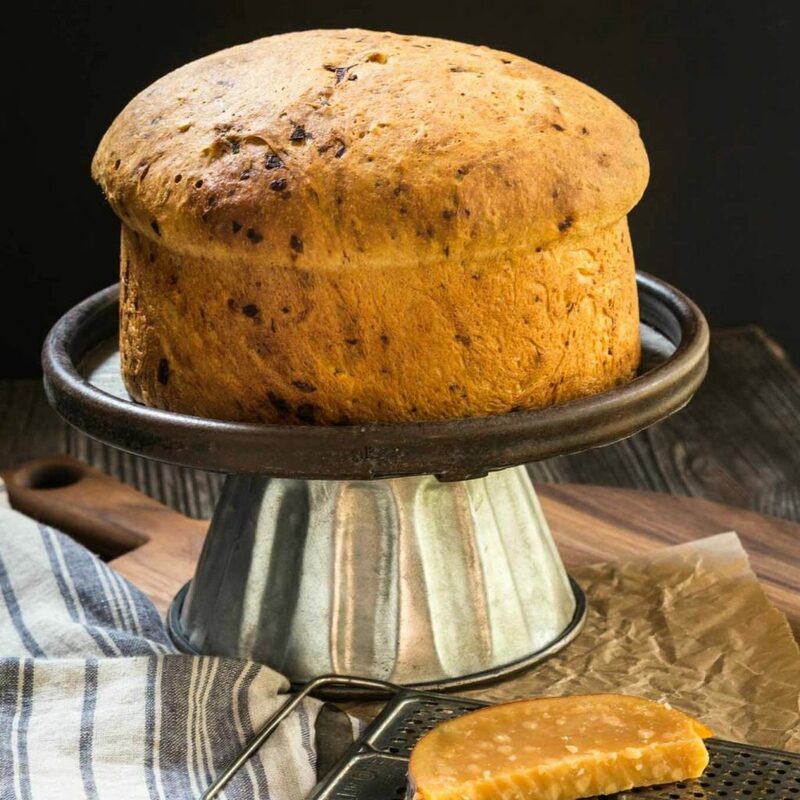 The poolish is made the day before and adds to the development of flavor. The garlic can be baked in advance as well. 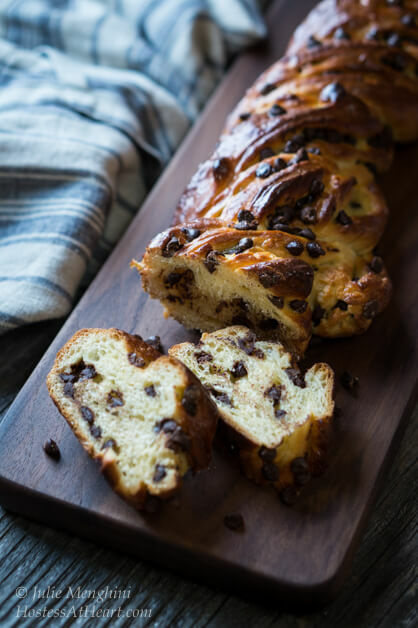 Recipe adapted from King Arthur Flour European-Style Hearth Bread. 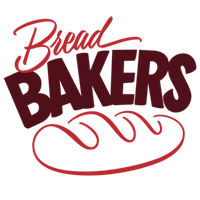 Don’t forget to take a look at these other Bread Bakers recipes too! You know how much I love baking bread right? 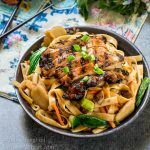 I loved making this one and here are a couple other recipes I really enjoyed. I have been working on making sourdough bread with my own starter for the last few months. I am loving the ease of this recipe. and the crumb on this loaf looks incredible!! It really is easy Angela! I loved seeing your recent bread. It was just gorgeous! Hey friend I wanted to swing back by and say I made this yesterday and it’s DELICIOUS! The whole house smelled amazing – FIVE STARS!!! Thank you, Deb! I’m sure they try and bottle that smell! I’d buy it. This loaf is so amazing! That crust is everything I want! Thank you! I’m all about the crust too! 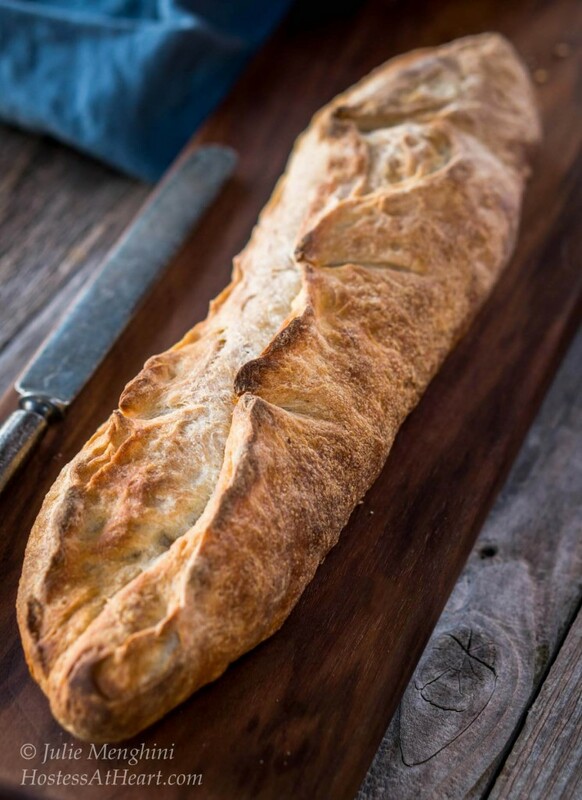 This is probably the prettiest loaf of bread l’ve seen…even better than our local bakery. 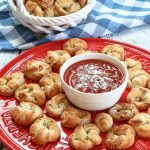 Perfect addition to an Italian meal, especially with that garlic! My goodness… you always make me crave bread! I can almost smell the loaf in my oven as I read about it!